Most of us do not think a great deal about our teeth unless we’re having problems. We know we should brush and floss twice daily - but because of a hurried schedule, we may rush through the process. Even with the best daily care, due to genetics or other issues, some people may experience pain, decay, and other dental issues. Oral health issues are surprisingly common, and can affect us at any age. • For children, the most common chronic disease is tooth decay - more prevalent than asthma and hay fever. Tooth decay can prevent a child from eating, sleeping, and functioning well at home and school. Untreated dental decay can also affect a child’s self-esteem and social development. • Approximately 80% of adults have some form of gum disease. Research shows that periodontal disease can increase the risk of heart disease, disrupt blood sugar regulation in diabetics, and for pregnant women, can lead to preterm birth. • Seniors are at increased risk for gum disease, dry mouth, denture-induced inflammation and oral cancer. Those who experience chronic oral pain may be unable to eat properly, which can lead to health problems and a reduced quality of life. Health problems caused by dental issues can be prevented or diagnosed early with regular dental visits. Just as patients with health insurance are more likely to regularly see their physician for preventative care, so too patients with dental insurance are more likely to have preventative dental care such as cleanings, fillings and check ups. Yet routine dental care is still not included in most health insurance plans. Many TMA members receive dental insurance as part of an employer benefits package, but independent and retired physicians may have to provide their own benefits. Seniors are especially affected, since neither Medicare nor most Medigap policies have a provision for preventative dental care or routine dental procedures, and only 2% of retirees have dental coverage through their former employer. We at TMA Insurance Trust want to support member physicians in every way possible. We highly value the work you do and the care you provide to millions of patients across Texas. That’s why we have partnered with MetLife to offer comprehensive dental coverage. Our goal is to help you save on the cost of dental care for yourself, your family, and your medical practice staff. 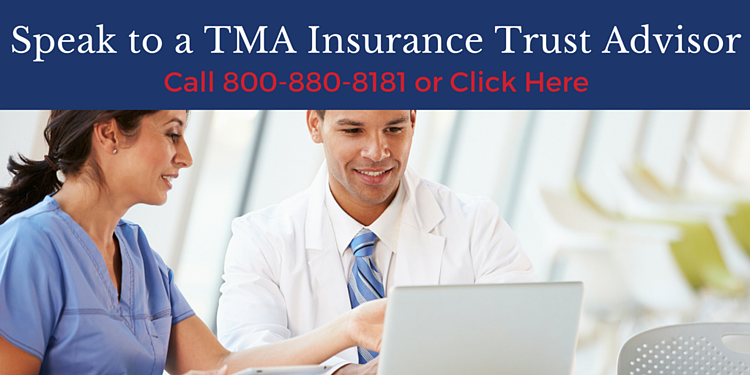 • Whether you are looking for coverage for yourself, your family, or for staff members in your medical practice, TMA Insurance Trust has affordable options to fit your situation. • You can have access to an expansive network that includes nearly 80% of all dental offices. But your choices don’t end there; you have the option to visit any licensed dentist, even out-of-network. • Receive 100% coverage on in-network preventive care and an average of 33% savings on in-network dental services. If you choose to go out of network, you will still enjoy discounted group rates. • In an industry that is largely commission-based, TMA members will receive unbiased guidance from an insurance advisor who does not work on commission. Our only goal at TMA Insurance Trust is to serve and support you as a TMA member.